This story was researched and written by Tony Pawlyn of the Bartlett Library at the Museum for the 2005 commemoration of the Trafalgar Despatch. It is probably the most definitive version of the story, drawing, as it does, on local knowledge and publications. Any diplomat or officer of the Crown bringing home news of a major British success or victory in battle could expect to be handsomely rewarded. This was certainly so in the case of the officer bearing the Trafalgar dispatches, which duty and honour was entrusted to Lieutenant John Richards Lapenotiere, RN., by Admiral Collingwood – Nelson’s successor as Commander-in-Chief of the fleet. Lapenotiere, as Commander of HM Schooner Pickle, was appointed by Collingwood to convey his official dispatches to the Admiralty, and thereby to inform the British Nation at large of the great sea-battle and the tragic death of the nation’s hero. But, in executing this duty and honour Lieutenant Lapenotiere, was nearly frustrated by the actions of another naval officer. This opportunist latched onto a chance of snatching the glory for himself, but details of his actions have largely been obscured by the mists of maritime history. 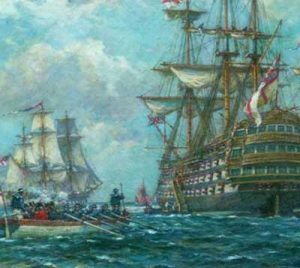 The following account confirms Lapenotiere’s claim to have delivered the Trafalgar dispatches and reveals his rival’s actions, while focusing on their dramatic sea race for England and Glory.